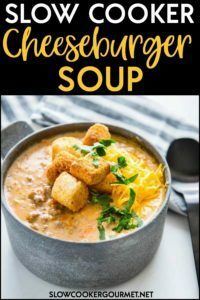 Slow Cooker Cheeseburger Soup is a simple and delicious comfort food that is topped with crispy tater tots or Texas toast croutons for a winning meal! This tasty dish will soon be a family favorite! Back to school for the kids, fall temps in the early mornings and soup in the slow cooker. 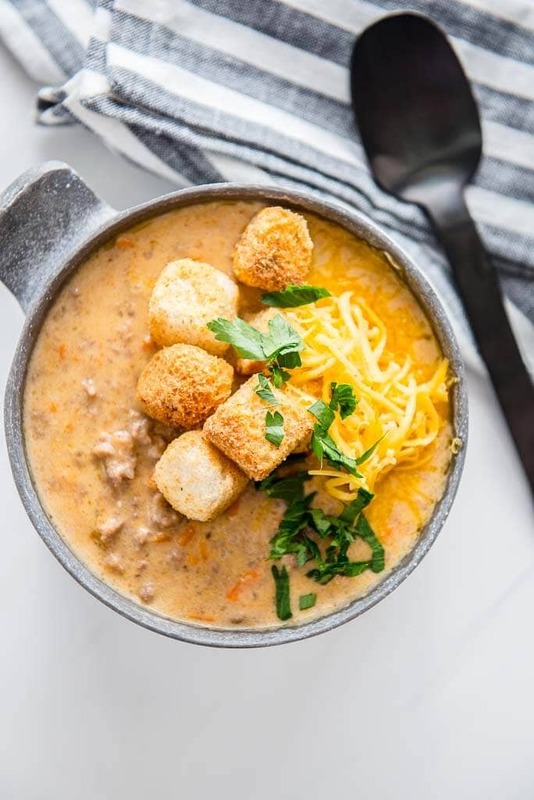 I’d have to say the best time of year has arrived once again and to celebrate I’d like to share my newest recipe, Slow Cooker Cheeseburger Soup! You won’t believe how simple this recipe is to make and how filling it is to satisfy even the hungriest of appetites! Although, be prepared, it’s so tasty that you may just scoop up bowl after bowl until your stomach is so full you can’t eat another bite! That’s what we did at our house and sadly had no leftovers. Next time, double batch! When I created this recipe it was important to me was that it was not only delicious, but that it actually tasted like a cheeseburger. And I’m here to tell you, it really does! 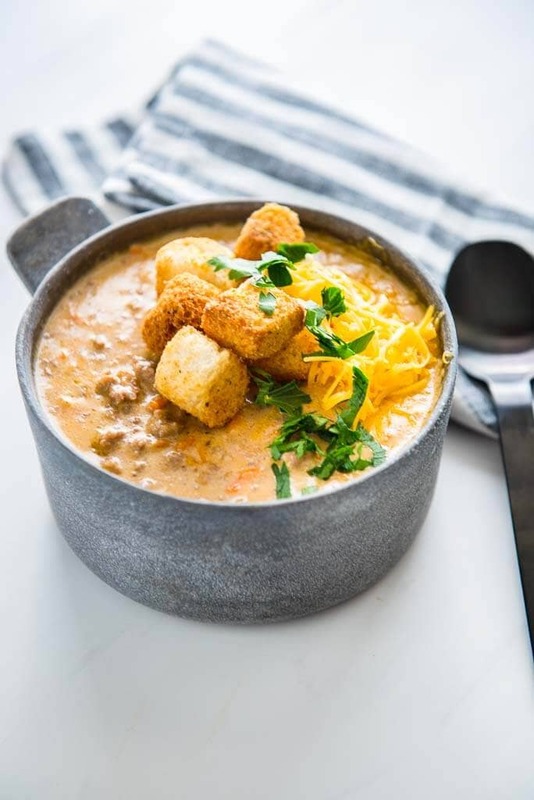 Want to know the key to this Slow Cooker Cheeseburger Soup tasting EXACTLY like a cheeseburger? Plenty of fresh shredded cheese. I used Colby jack cheese in this recipe. Use the right seasoning. I absolutely love using McCormick’s Pub Burger seasoning when I make actual burgers, so for me it was the obvious choice for the soup. Use whatever burger seasoning is your favorite! Get the ingredients in your slow cooker, set it and forget it. My favorite way to make the prep of soups like this even easier is to use my multi-cooker! Brown meat and cook all in one pot and save time and clean-up. Now, I did add some carrots and celery, which are obviously not a typical part of burger prep, but I find them to be a good sub since you won’t likely be adding lettuce and tomato but want to pack some veggie nutrition here. They don’t have an overwhelming flavor in the soup but add just what you need to get a nice texture in a hearty soup like this. 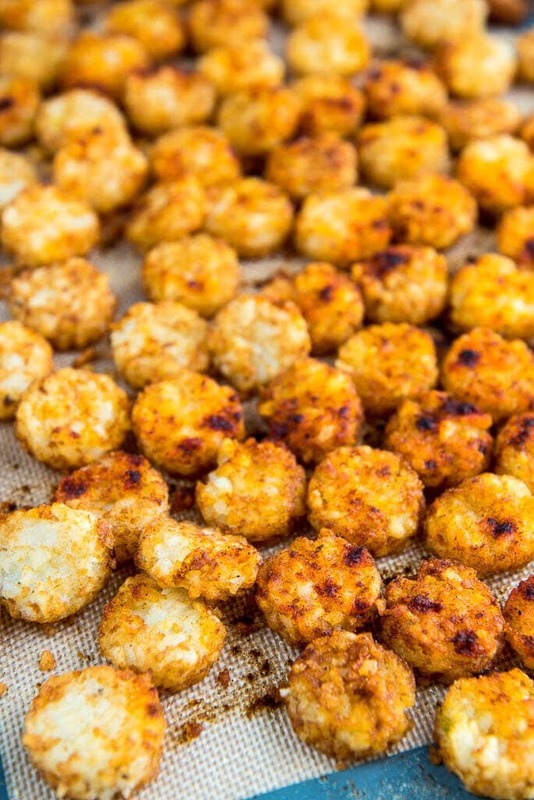 To make it easy on myself, and quite honestly to entice my 6 year old tater tot addict to eat, I chose to make some tater tot crowns, so simple and delicious. You can simply top with shredded cheese and scallions. 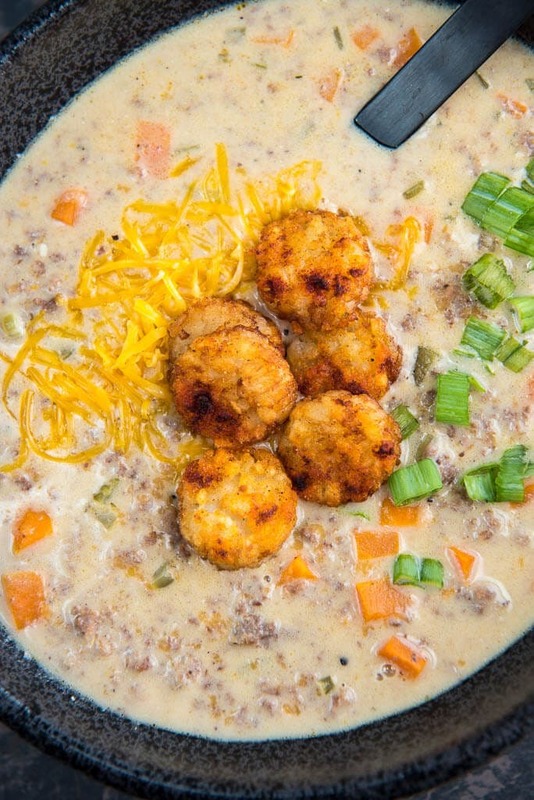 Try cutting up some burger buns, toasting them up and sprinkling on top of this cheeseburger soup. Perfect! Just go with what works best for you here. Either way, I’m placing a pretty strong bet you will love this soup as much as we did. 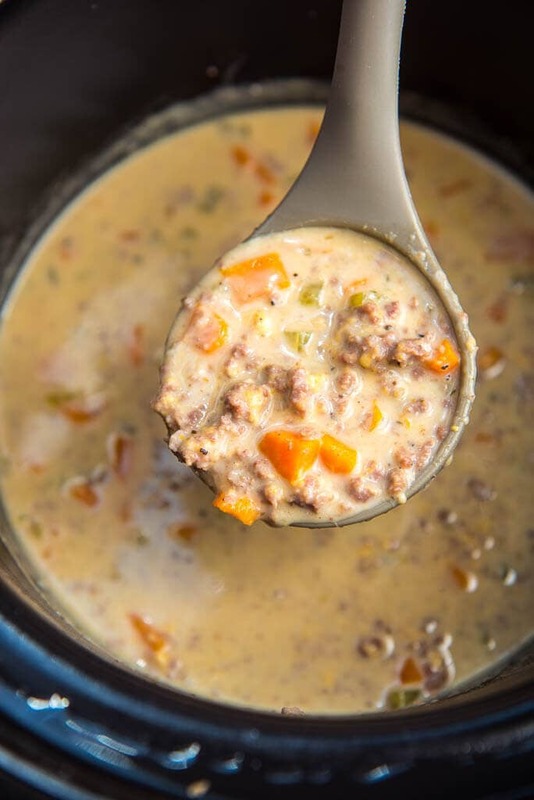 Love this Slow Cooker Cheeseburger Soup? Try these equally simple and delicious slow cooker soups! 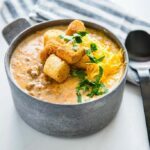 Slow Cooker Cheeseburger Soup is a simple and delicious comfort food that is topped with crispy tater tot crowns for a winning meal! This tasty dish will soon be a family favorite! Hi! This looks delicious, and I’m planning to make it tonight! Just one question…so there’s no need to sauté the carrots and celery first? Delicious!! I have made this several times and in fact it is in my slow cooker as I type for dinner tonight! Love this!! One of our favorites! Can you make this same receipe on the stovetop? yes, of course! Cook the ground beef, add ingredients, simmer until carrots/celery are tender!